Very tight sharp bass which gives the impression of doing it all too easy without breaking a sweat. Good looks, nice build. Tough 'kid proof' front mesh grill. The gain adjustment dial is behind the grill which is bad. Everytime you wish to turn the sdub up or down slightly depending on what your listening too, you need to remove the grill which is very tight. Probably a bit pricey but you get what you pay for. After listening to many subwoofers I was really starting to get confused but when I listened to the 422 sub I was impressed enough to hand over the cash. 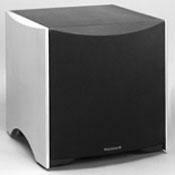 The front firing sub is a sealed enclosure and provides a very tight sound. I run the sub on about 30% gain and it provides a very nice thump in your chest in a pretty large room. It has plenty of fine tuning adjustments on the back including crossover frequency, phase, direct out for daisy chaining more subs. I chose the matt black finish although ther gloss finish looks very neat but it is a couple of hundred more. Please note that the purchase price is in Australia $. Very Very happy.